The posterior ramus of spinal nerve (or posterior primary division) refers to the posterior division of a spinal nerve. 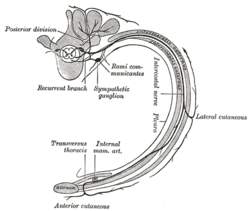 The ramus is also known by a number of other names, "posterior (or dorsal) rami (or branches or divisions) of the spinal nerves". The posterior ramus is one of two major branches of a spinal nerve that emerge after the nerve emerges from the intervertebral foramen. The posterior ramus carries information that supplies muscles and sensation to the human back. 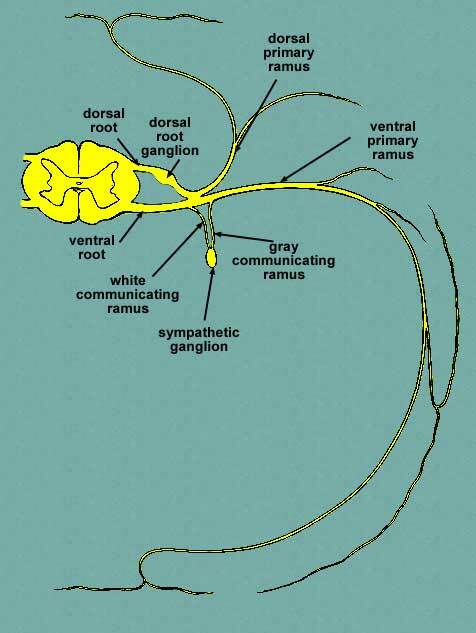 Shortly after a spinal nerve exits the intervertebral foramen, it branches into the posterior ramus, anterior ramus, and rami communicantes. Each of these carries both sensory and motor information. After it is formed, the posterior ramus (plural: rami) of each spinal nerve travels backward, except for the first cervical, the fourth and fifth sacral, and the coccygeal. Posterior rami divide into medial, intermediate, and lateral branches. The lateral branch supplies innervation to the iliocostalis muscle, as well as the skin lateral to the muscle on the back. The Intermediate branch supplies innervation to the spinalis muscle and the longissimus muscle. The medial branch supplies innervation to the rest of the epaxial derived muscles on the back (inlcuding the transversospinalis muscles, intertransversarii muscles, interspinalis muscles, and splenius), and the zygapophyseal joints. Nomina Anatomica lists dorsal primary rami as "rami dorsales" for each group of spinal nerves: 1) cervical (nervorum cervicalium ), 2) thoracic (nervorum thoracicorum ), 3) lumbar (nervorum lumbalium ), 4) sacral (nervorum sacralium ), and 5) coccygeal (nervi coccygei ). Because each spinal nerve carries both sensory and motor information, spinal nerves are referred to as “mixed nerves." Posterior rami carry visceral motor, somatic motor, and sensory information to and from the skin and deep muscles of the back. The posterior rami remain distinct from each other, and each innervates a narrow strip of skin and muscle along the back, more or less at the level from which the ramus leaves the spinal nerve. 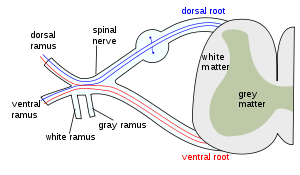 The formation of the spinal nerve from the dorsal and ventral roots.